Lobster is certainly one of life’s simplest pleasures, but cooking lobster is an art form. If you have any questions about lobsters, you may just find the answer you’re looking for in our selection of Frequently Asked Questions. Steaming and boiling are the two most common ways to cook lobsters. Some people prefer to grill and barbecue their lobster, while others prefer to poach and parboil their lobster if they need to use it in another dish. Boiling: Best for cooking four or more lobsters at a time. Fill a large pot 2/3 full of water, add one to two tablespoons of salt per gallon. Bring water to a rolling boil, add lobsters, and start timing. Steaming: Yields more tender meat than boiling. Fill a large pot with two to three inches of water. Bring to a rolling boil, add the lobsters, cover, and steam. Steaming time should be eight minutes per pound, and three additional minutes per pound for each additional pound thereafter. Grilling: Imbues the smoky flavors of the coals and any marinades or butters. Make sure your grill is clean and the grates are lightly oiled. Set to medium heat (about 350 degrees). Crack both claws enough to break the shells. Brush the lobster meat with a mixture of oil or butter, salt, and pepper. Place halves shell side down on the grill until they’re opaque in the thickest portion of the tail (about six to eight minutes). Parboiling: Fill a large pot 2/3 full of water, add one to two tablespoons of salt per gallon. Bring water to a rolling boil, and add lobsters, but only blanch for two to three minutes. Store the lobsters in their shells to prevent loss of juices or drying. You should use any unused lobster meat within two to three days. How long does it take to boil lobster tails per ounce? Lobster tail is a good gauge of freshness. It will contract and curl when cooked, but the meat will be somewhat firm. 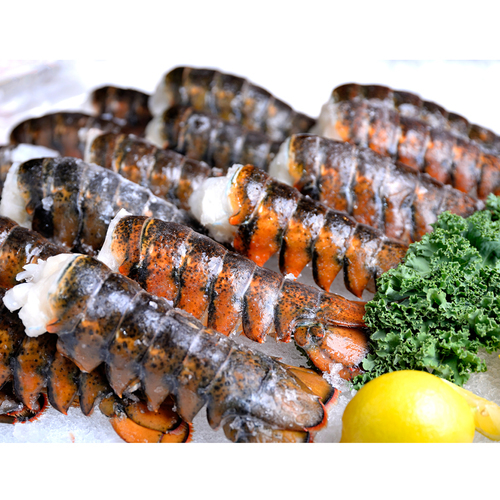 Baked or boiled lobster tails will typically take one to one-and-a-half minutes per ounce to cook. (i.e. : a four-ounce lobster tail will take four minutes). If tails still show some translucency, cook for one-minute increments until done. Cooking lobster tails is slightly different than cooking lobster meat. Most people prefer one of the four common ways to cook lobster tails: baking, boiling, grilling, or steaming. No matter what method you choose, the finished product will look great and taste even greater with a side of butter, corn on the cob, ciabatta bread, or a summer garden salad. Baking: Reduces the risk of overcooking your lobster tails. Preheat the oven to 450 degrees. Butterfly each lobster tail using a pair of kitchen shears. Place tails in a baking pan, and brush the meat with lemon juice, melted butter, salt, pepper, and parsley. Bake for 25 minutes or until the meat is firm and opaque. Boiling: This quick and easy method doesn’t require any butterflying. Just throw the lobster tails in a large pot of boiling, salted water. Simmer for eight to 12 minutes, or until the tails have turned bright red. Cut the shells lengthwise to expose the meat before serving. Grilling: Preheat your grill to medium-high heat. Butterfly the tails and pull the shell away from the meat. Rinse the tails with cold water. Keep it simple by lathering the tails in olive oil or butter, and place the tails shell down on the grill. After 10 to 12 minutes, your lobster tails should turn opaque. Steaming: This is the easiest and healthiest way to enjoy lobster tails at home. Fill a pot with one inch of water and place a steaming basket on top before bringing the water to a boil. Butterfly your lobster tails. Place them in the center of the steaming basket and steam for roughly one minute per ounce until the meat has turned white and is firm to the touch. If you live far from the coast, it’s always better to stock up on frozen lobster. If you’re planning a dinner party or date night for two, it’s important to thaw your lobster tails in a safe and sanitary way. If your tails aren’t thawed throughout, the meat inside will not cook properly. Quick-thaw your lobster tails by placing the sealed bag in cold water for 30 to 60 minutes. Replace water at least once to keep cold. If you’re not in a hurry, you can thaw your lobster tails in the refrigerator for one day prior to cooking them. Once your tails are thawed, you can bake, boil, grill, or steam them. What is cold water lobster? Most people don’t know the difference between warm water and cold water lobster. Warm water lobsters come from places like Florida, the Caribbean, or Latin America. These lobsters are usually softer and more difficult to firm even when cooked properly. Cold water lobsters, on the other hand, have a firm, white meat that tastes cleaner than their warm water counterparts. Cold water slows down the process of growth and results in tastier lobster meat.